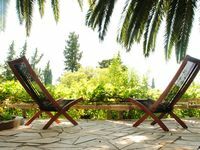 Property 48: Villa Giulia with private pool, near Dubrovnik. Irena is very friendly and helpful and returns calls very quickly. Very functional house for our larger group. 4 bedrooms and bathrooms - lots of private sleeping areas. However, air conditioning only installed in 3rd floor bedroom only. Thanks goodness there were fans! Our luck was to visit during a heat wave. Although lots of room both inside almost, no comfortable seating areas. Quite a steep hike to get to the beach. The country and islands were incredibly beautiful and well worth a visit. Dubrovnik itself was magical - highly recommend taking the Walls and Wars and Old town walking tours! Dubrovnik&rsquo;s history is not well know but fantastically interesting. We had 2 families rent the whole house for our stay. While very tricky to find (driving up tiny, one-way streets), upon arrival, the house was spacious and well-suited for families. The turtles in the garden created much excitement for the children staying. Each room had a double bed (or 2 singles together), its own bathroom/shower and very welcome aircon and fan. The rooms didn't seem to have much sound-proofing, but as we hired the whole apartment, it was fine for our needs. Kitchen was good and we made the most of the outdoor spaces for breakfasts. It was a short walk to beaches (our kids loved the nearby floating aqua park) and restaurants, which made evenings easy. WiFi was patchy - we found it very difficult to access downstairs, and with the number of guests we had staying (8) perhaps it was a little strained under the use. We travelled to Dubrovnik Old Town by bus, which was straightforward to find, however no timetable was provided, so we just had to try our luck. The return bus stop from Old Town was in a different location than we expected, so this required some navigation. We also found Uber a more helpful and reasonably priced alternative to Taxis during our stay. Overall, we were very happy with our location, and had an enjoyable stay. Patricija (who assisted us when we arrived) was professional, approachable and understanding. Future travellers would do well to note you are expected to pay for the use of the washing machine, and although prices for bus fares etc are quoted in Euro in the in-house information guide, only Croatian Kuna is accepted as legal currency in Dubrovnik.